Kruger National Park (KNP) rangers together with the South African Police Services (SAPS) discovered a dead body of someone who is believed to be a fish suspected poacher who was attacked by a buffalo on February 21, 2012 at Mphongolo River inside the Park. The body was discovered after it was reported to the Chief of Mavilingwe Village, an area south of Punda Maria Gate and the case was referred to the local Police Station and Rangers for further investigation. Three individuals who are currently fish poaching suspects and were with the deceased yesterday when he met his untimely death tried to carry him after the attack but eventually left him under the tree to go and seek assistance. Upon receiving the news, the police together with KNP Rangers immediately rushed to the area and upon arrival, they discovered that the man had passed on already. According to the three suspects who were with the deceased, the four men entered the park in the afternoon of February 21, 2012 to go fishing in the river illegally using gill nets. 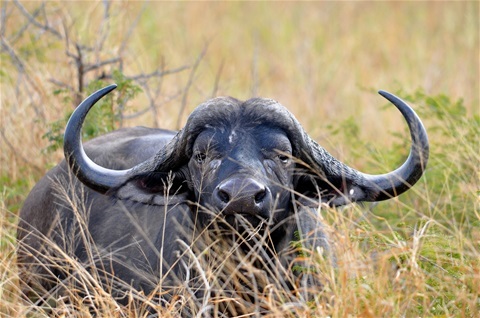 Whilst on the way there, they came across a single buffalo bull sleeping under the trees, but it woke up and charged them upon detecting their movements. They all ran to different directions. The three surviving suspects managed to escape the buffalo but the deceased was not lucky as he happened to be the target of the buffalo which viciously attacked him over a long distance until he met his untimely death. It was only after the surviving suspects ran home for assistance and that is when the case was reported to the police on the same night.